This is for free use by residents in the case of a flood emergency. The bunker is unlocked and is situated in the yard of Holt Superstore, against the end wall of the Village Hall. Clearly the quantity of materials is limited and anyone using the equipment should advise the Parish Clerk in order that stocks can replenished. All unused materials should be returned to the bunker. There is a permanent menu for flooding on the left hand side of this website which will be updated as necessary. 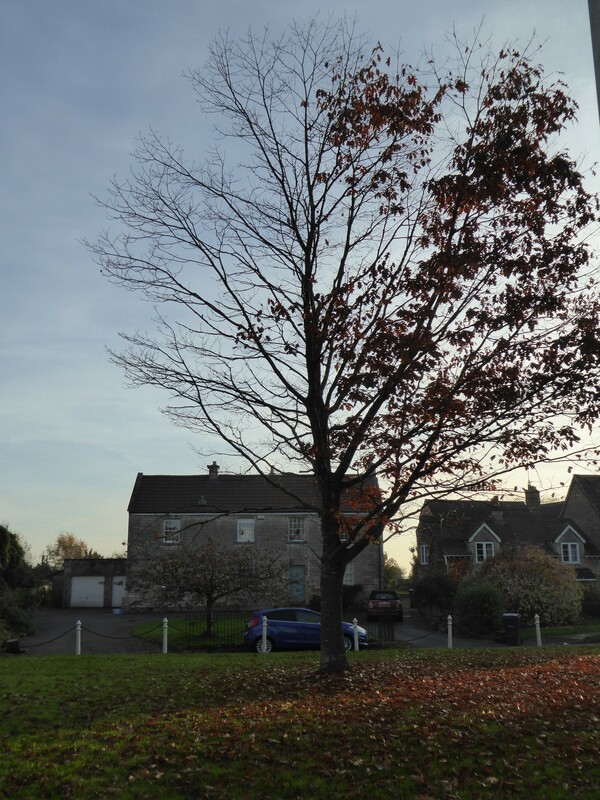 The tree (believed to be american red oak) on Ham Green has died on one side. 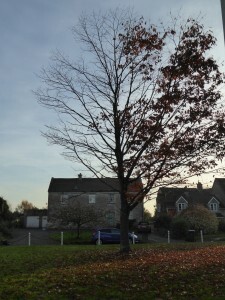 Having taken advice, the Parish Council have applied to Wiltshire Council for, and been given, consent to remove the tree. The work will be undertaken on 24 November. Tenders are being invited for caretaking and grass cutting in Holt. Information may be found here. Work has started today on Dawes Pond. By early next week the pond will be re-modeled to include a shallow safety area around the side and a buried neoprene lining . There will also be an electric pump to top up the water from the brook. The work is being paid for from the Parish Council village amenity fund and a generous donation from Nick and Alix Kirkham of Glove Factory Studios. Over a number of years the Parish Council has tried various ways of restoring Dawes Pond to its former glory. Sadly, in spite of considerable effort and expenditure, none has been successful.The problem is two-fold – firstly, stopping leaks and keeping water in the pond and secondly, topping up the water when it gets low. Without going into every detail of what has been tried before, the Parish Council are now advised that fitting a liner is the best solution, together with an electric pumping system for topping up the pond when the water level falls through evaporation. having spent £2000 re shaping and dredging the pond the Parish Council now needs to raise an additional £6-7000.00 to complete the work. Some of this money can undoubtedly be raised by “matched funding” grants but a substantial part will have to be found from other sources. Opinion is mixed as to whether this is money worth spending but many villagers (and the children of Holt School) have strongly expressed the view that this is an amenity that should be kept and restored. Please contact the Parish Clerk if you can help. The annual safety inspection of the playground found wood rot in the top beam of the climbing frame. This equipment has been put out of use until a new beam is fitted. Update June 2015: We have agreed funding to replace the top beam and hope to have the equipment back in use very soon.